Assistant Program Manager’s under the supervision of Program Managers manage various related projects as a means to enhance the performance of an organization. Apart from supporting the Program Managers in system engineering projects, these assistants also disburse other roles and responsibilities such as – assisting in the practical management of the project, synchronize and prioritize the resources; planning, alignment, management, designing and integrating projects; supervising projects, assisting in finalizing project and track employee performance. Candidates seeking to get into this position should have skill sets that constitute good leadership, managerial, motivational and analytical skills. They should possess overall knowledge of the related projects and be broad minded to understand and implement the company policies and strategies effectively. They should share a good connection with Program managers and also with other employees; the ability of good grasping and to learn through experience would be well-appreciated. 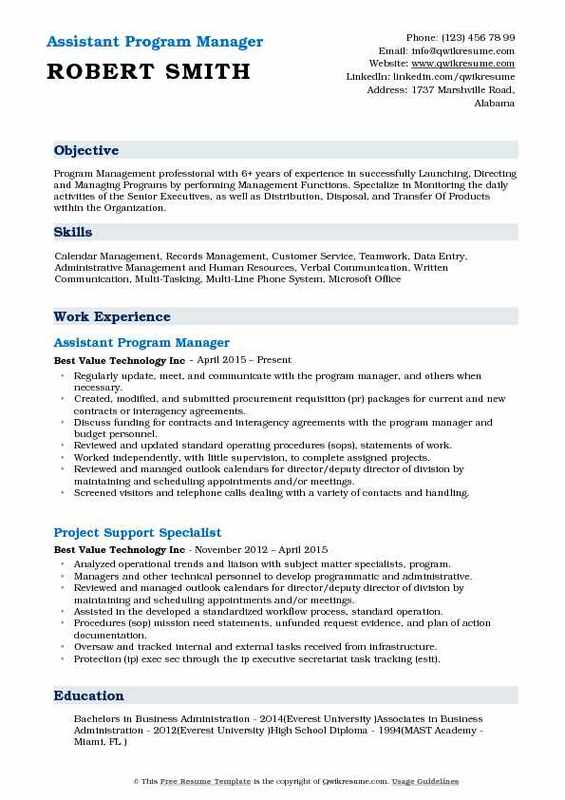 A well-crafted Assistant Program Manager Resume embraces a degree in the field of Information technology or business administration. Summary : Results-oriented professional with 35 years of practical work experience including 26 years of experience in a diversified maritime industry with a proven ability to lead and effectively recruit, train, manage and motivate culturally diverse and success-driven teams of qualified personnel to accomplish any task. 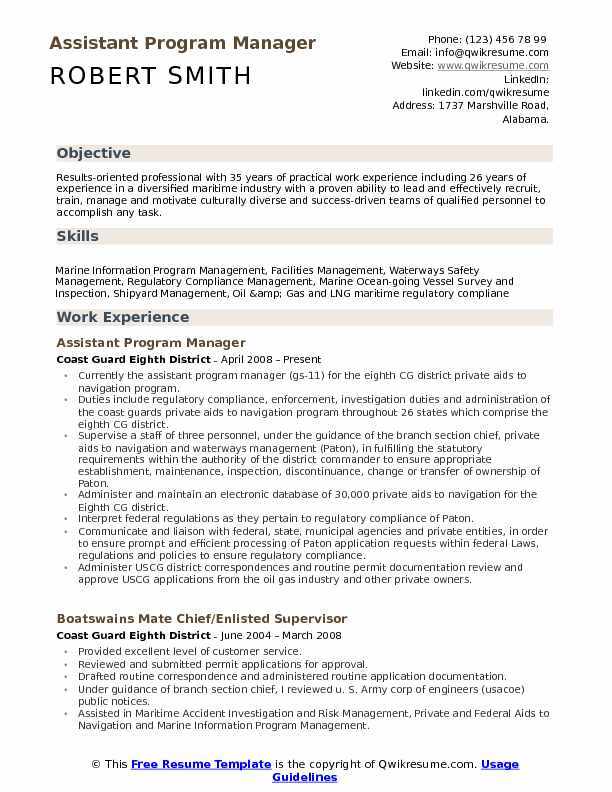 Currently the assistant program manager (gs-11) for the eighth CG district private aids to navigation program. Duties include regulatory compliance, enforcement, investigation duties and administration of the coast guards private aids to navigation program throughout 26 states which comprise the eighth CG district. Supervise a staff of three personnel, under the guidance of the branch section chief, private aids to navigation and waterways management (Paton), in fulfilling the statutory requirements within the authority of the district commander to ensure appropriate establishment, maintenance, inspection, discontinuance, change or transfer of ownership of Paton. Administer and maintain an electronic database of 30,000 private aids to navigation for the Eighth CG district. Interpret federal regulations as they pertain to regulatory compliance of Paton. Communicate and liaison with federal, state, municipal agencies and private entities, in order to ensure prompt and efficient processing of Paton application requests within federal Laws, regulations and policies to ensure regulatory compliance. Administer USCG district correspondences and routine permit documentation review and approve USCG applications from the oil gas industry and other private owners. Maintain the accuracy level of knowledge regarding approved and unapproved Paton equipment and navigation regulations. Provide recommendations to supervisor for the processing of Paton related marine information for publication in the local notice to mariners. 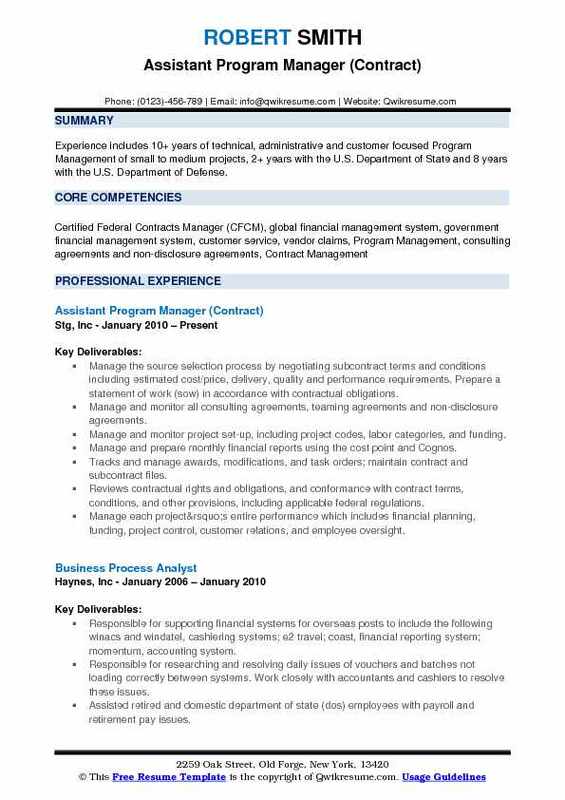 Summary : Experience includes 10+ years of technical, administrative and customer focused Program Management of small to medium projects, 2+ years with the U.S. Department of State and 8 years with the U.S. Department of Defense. Manage the source selection process by negotiating subcontract terms and conditions including estimated cost/price, delivery, quality and performance requirements. Prepare a statement of work (sow) in accordance with contractual obligations. Manage and monitor all consulting agreements, teaming agreements and non-disclosure agreements. Manage and monitor project set-up, including project codes, labor categories, and funding. Manage and prepare monthly financial reports using the cost point and Cognos. Tracks and manage awards, modifications, and task orders; maintain contract and subcontract files. Reviews contractual rights and obligations, and conformance with contract terms, conditions, and other provisions, including applicable federal regulations. Manage each project’s entire performance which includes financial planning, funding, project control, customer relations, and employee oversight. Monitor and manage contract performance through telephone conversations, correspondence, site visits and progress reports. Organize and prepare new employee’s relocation, security clearance, country clearance, stg orientation. Prepare all employees monthly housing allowance, danger pay, hardship pay and cost of living allowance (cola) for submission to payroll. Summary : Obtain a position with an innovative company where I can maximize my program management experience by utilizing highly effective communication skills, liaising between client/business teams and technical areas to achieve on-time, on-budget and on-spec milestones to meet project deliverables in a process based, quality driven manner. 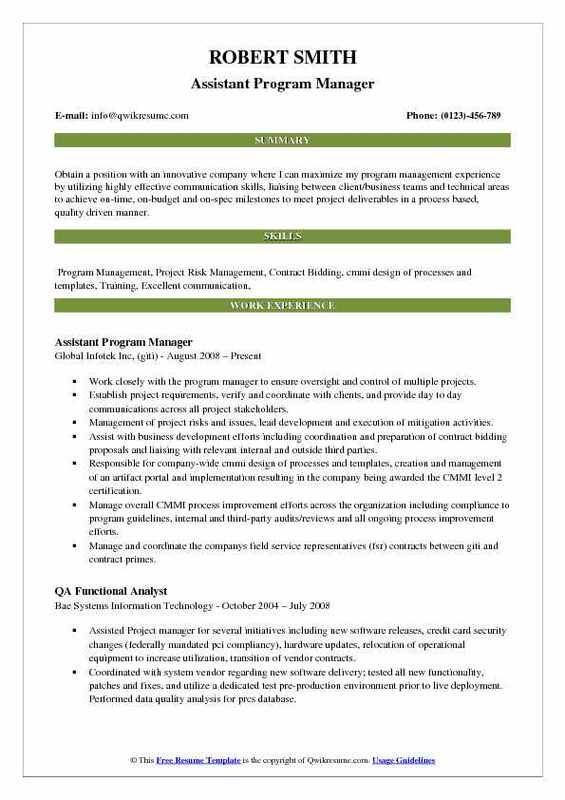 Work closely with the program manager to ensure oversight and control of multiple projects. Establish project requirements, verify and coordinate with clients, and provide day to day communications across all project stakeholders. Management of project risks and issues, lead development and execution of mitigation activities. Assist with business development efforts including coordination and preparation of contract bidding proposals and liaising with relevant internal and outside third parties. Responsible for company-wide cmmi design of processes and templates, creation and management of an artifact portal and implementation resulting in the company being awarded the CMMI level 2 certification. Manage overall CMMI process improvement efforts across the organization including compliance to program guidelines, internal and third-party audits/reviews and all ongoing process improvement efforts. Manage and coordinate the company's field service representatives (fsr) contracts between giti and contract primes. Perform duties of an information system security officer (isso) for classified, secured project facilities. Creation of periodic management and client project reports and presentation materials. 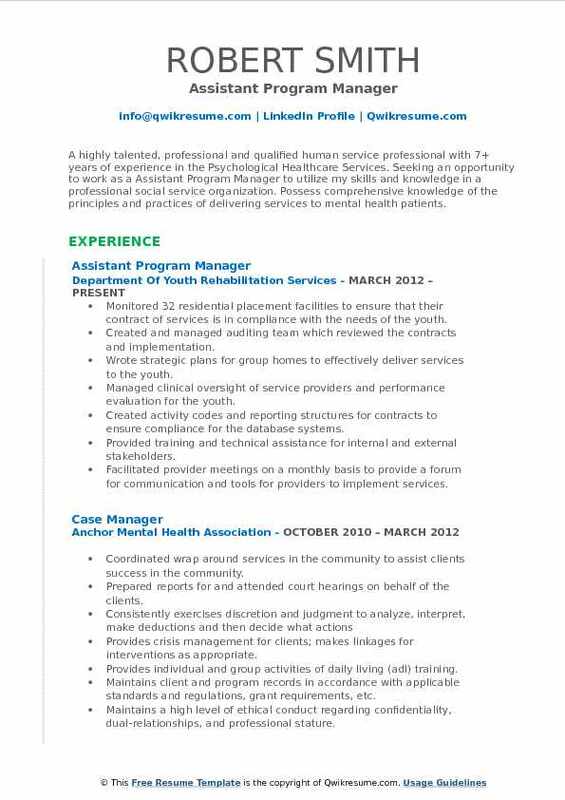 Summary : A highly talented, professional and qualified human service professional with 7+ years of experience in the Psychological Healthcare Services. 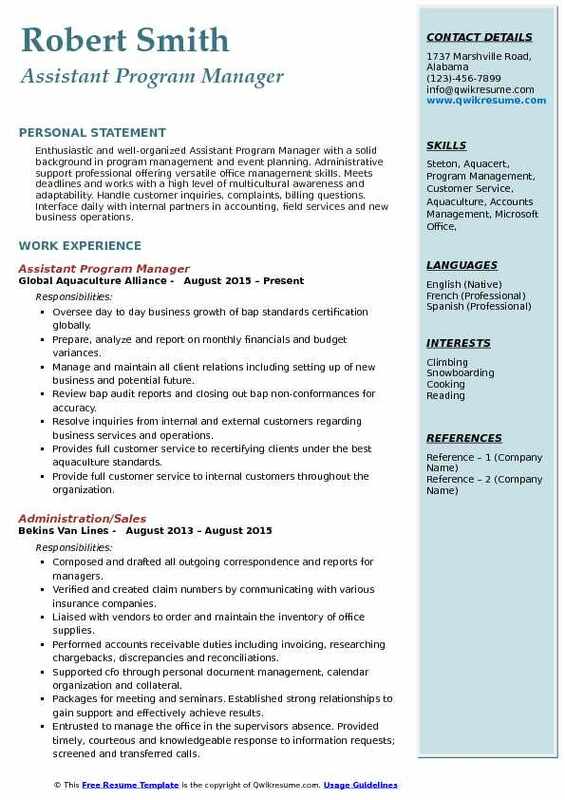 Seeking an opportunity to work as a Assistant Program Manager to utilize my skills and knowledge in a professional social service organization. Possess comprehensive knowledge of the principles and practices of delivering services to mental health patients. Monitored 32 residential placement facilities to ensure that their contract of services is in compliance with the needs of the youth. Created and managed auditing team which reviewed the contracts and implementation. Wrote strategic plans for group homes to effectively deliver services to the youth. Managed clinical oversight of service providers and performance evaluation for the youth. Created activity codes and reporting structures for contracts to ensure compliance for the database systems. Provided training and technical assistance for internal and external stakeholders. Facilitated provider meetings on a monthly basis to provide a forum for communication and tools for providers to implement services. Created a multidisciplinary report for any youth in a community based residential facility for the provider to utilize on a monthly basis. Impacting the effective and efficient administration of program and service delivery. Assessing the impact and viability of re-acquiring the evening reporting centers. Participated on the committee to review the yearly contracts of the current community. Objective : Enthusiastic and well-organized Assistant Program Manager with a solid background in program management and event planning. 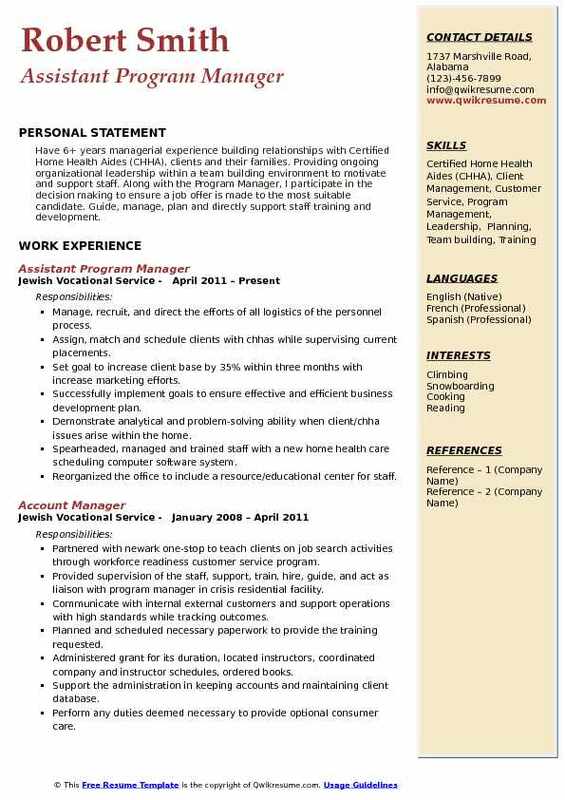 Administrative support professional offering versatile office management skills. Meets deadlines and works with a high level of multicultural awareness and adaptability. Handle customer inquiries, complaints, billing questions. Interface daily with internal partners in accounting, field services and new business operations. Oversee day to day business growth of bap standards certification globally. Prepare, analyze and report on monthly financials and budget variances. Manage and maintain all client relations including setting up of new business and potential future. Review bap audit reports and closing out bap non-conformances for accuracy. Resolve inquiries from internal and external customers regarding business services and operations. Provides full customer service to recertifying clients under the best aquaculture standards. Provide full customer service to internal customers throughout the organization. Liaison between departments, third-party vendors, and external customers. Duties include working closely with customers, iso CBS, and other offices. Maintain spreadsheets, tracking and documents, issue resolution, and customer retention. 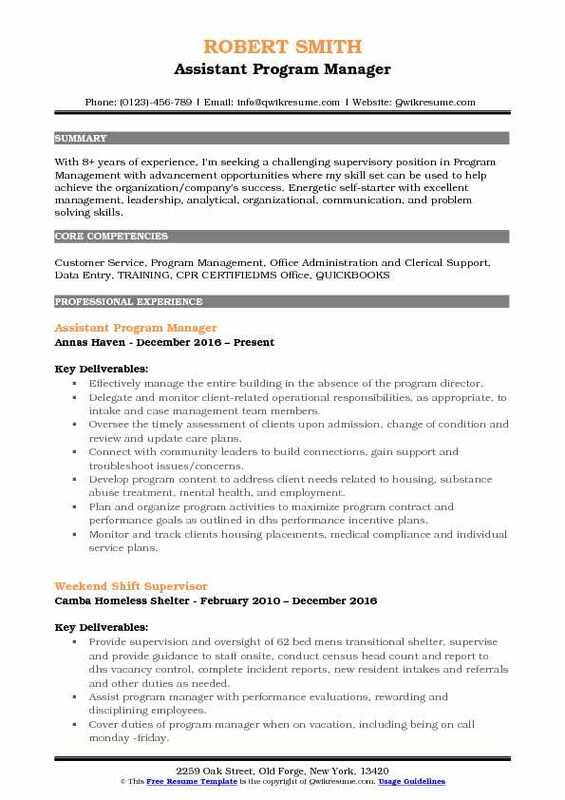 Headline : Program Management professional with 6+ years of experience in successfully Launching, Directing and Managing Programs by performing Management Functions. Specialize in Monitoring the daily activities of the Senior Executives, as well as Distribution, Disposal, and Transfer Of Products within the Organization. Regularly update, meet, and communicate with the program manager, and others when necessary. Created, modified, and submitted procurement requisition (pr) packages for current and new contracts or interagency agreements. Discuss funding for contracts and interagency agreements with the program manager and budget personnel. Reviewed and updated standard operating procedures (sops), statements of work. Worked independently, with little supervision, to complete assigned projects. Reviewed and managed outlook calendars for director/deputy director of division by maintaining and scheduling appointments and/or meetings. Screened visitors and telephone calls dealing with a variety of contacts and handling. Used and maintained office equipment (e.g., copiers, fax, telephones, personal. Prepared and reviewed office documents; proofreading outgoing correspondence to ensure correct grammar, spelling, and formatting; typed final draft of. Assisted in preparing agendas and/or other background materials for meetings. Summary : 10+ years of exemplary financial experience seeking to deliver excellence within the role of a Financial Assistant Program Manager. Keen eye for skillfully inspecting problems to devise innovative solutions. Strategic and known for creating strategies that are in alignment with various needs of multiple stakeholders. Process optimizer who can deliver results by maximizing organizational effectiveness and sustainability. Guided 33 employees to consistently succeed with meeting the contractual statement of work (sow) terms and conditions for US environmental protection agency headquarters’ mail center. Apply focus, attention to detail, and reliability to determine the best approach for completing all assignments before presenting results to the contracting officer representative (cor). Created strategies and schedules, estimate resource specifications, define milestones and deliverables, and monitor activities to report accomplishments to internal stakeholders. Vetted and approved all financial metric reporting required by the government on a daily, weekly, monthly, and annual basis before submission to cor. Remained compliant with all network and affiliate safety plans, policies, practices, and standards while reviewing and approving payroll for the entire staff. Exercised creative problem solving and team player capabilities to pinpoint solutions for intricate issues with assigned projects, including synergizing efforts with others to cultivate resolutions. Supervise the implementation of the new selective mailing system, which cultivated cost-effective services. 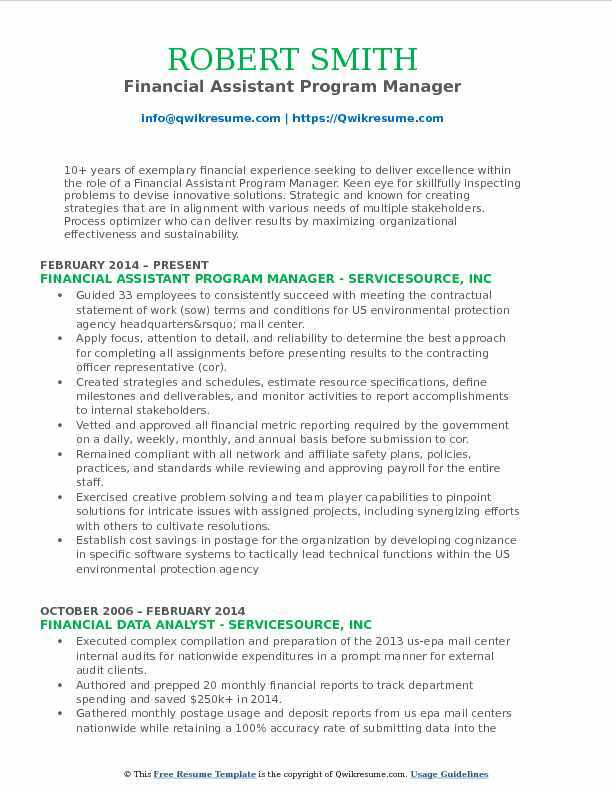 Summary : With 8+ years of experience, I'm seeking a challenging supervisory position in Program Management with advancement opportunities where my skill set can be used to help achieve the organization/company's success. Energetic self-starter with excellent management, leadership, analytical, organizational, communication, and problem solving skills. Effectively manage the entire building in the absence of the program director. Delegate and monitor client-related operational responsibilities, as appropriate, to intake and case management team members. Oversee the timely assessment of clients upon admission, change of condition and review and update care plans. Connect with community leaders to build connections, gain support and troubleshoot issues/concerns. Develop program content to address client needs related to housing, substance abuse treatment, mental health, and employment. Plan and organize program activities to maximize program contract and performance goals as outlined in dhs performance incentive plans. Monitor and track clients housing placements, medical compliance and individual service plans. Conduct periodic internal file reviews and implement quality assurance measures as needed to ensure quality service delivery to conduct and document one-on-one supervision of direct reporting staff to assess and improve work performance (i. E. Identify training needs, professional development, etc. ). Develop and implement crisis prevention/or intervention strategies to ensure a safe and secure environment. Summary : Have 6+ years managerial experience building relationships with Certified Home Health Aides (CHHA), clients and their families. Providing ongoing organizational leadership within a team building environment to motivate and support staff. Along with the Program Manager, I participate in the decision making to ensure a job offer is made to the most suitable candidate. Guide, manage, plan and directly support staff training and development. Manage, recruit, and direct the efforts of all logistics of the personnel process. Assign, match and schedule clients with chhas while supervising current placements. Set goal to increase client base by 35% within three months with increase marketing efforts. Successfully implement goals to ensure effective and efficient business development plan. Demonstrate analytical and problem-solving ability when client/chha issues arise within the home. Spearheaded, managed and trained staff with a new home health care scheduling computer software system. Reorganized the office to include a resource/educational center for staff. Facilitated and implemented employee retention training in the new-hire orientation. Entered schedules, appointments and tasks while using the rosenark intelligent matching system to find the right certified home health aide for a shift. 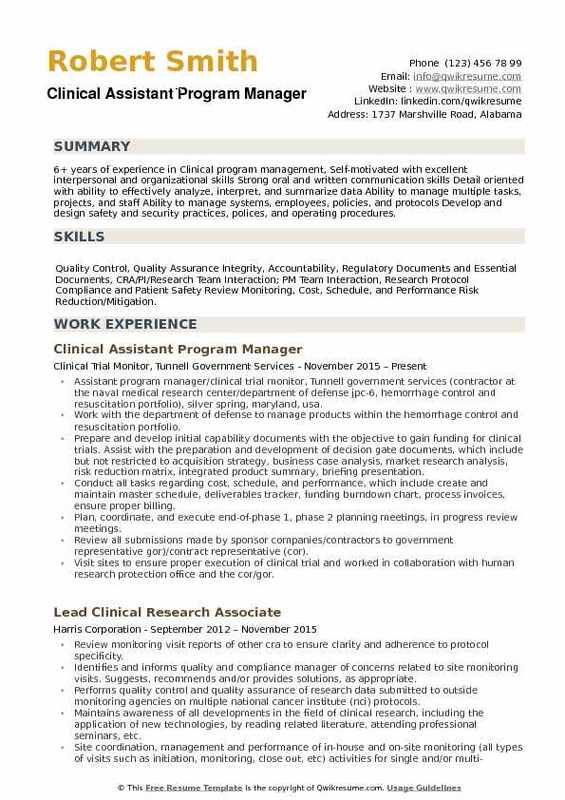 Headline : 6+ years of experience in Clinical program management, Self-motivated with excellent interpersonal and organizational skills Strong oral and written communication skills Detail oriented with ability to effectively analyze, interpret, and summarize data Ability to manage multiple tasks, projects, and staff Ability to manage systems, employees, policies, and protocols Develop and design safety and security practices, polices, and operating procedures. Skills : Quality Control, Quality Assurance Integrity, Accountability, Regulatory Documents and Essential Documents, CRA/PI/Research Team Interaction; PM Team Interaction, Research Protocol Compliance and Patient Safety Review Monitoring, Cost, Schedule, and Performance Risk Reduction/Mitigation. Assistant program manager/clinical trial monitor, Tunnell government services (contractor at the naval medical research center/department of defense jpc-6, hemorrhage control and resuscitation portfolio), silver spring, maryland, usa. Work with the department of defense to manage products within the hemorrhage control and resuscitation portfolio. Prepare and develop initial capability documents with the objective to gain funding for clinical trials. Assist with the preparation and development of decision gate documents, which include but not restricted to acquisition strategy, business case analysis, market research analysis, risk reduction matrix, integrated product summary, briefing presentation. Conduct all tasks regarding cost, schedule, and performance, which include create and maintain master schedule, deliverables tracker, funding burndown chart, process invoices, ensure proper billing. Plan, coordinate, and execute end-of-phase 1, phase 2 planning meetings, in progress review meetings. Review all submissions made by sponsor companies/contractors to government representative gor)/contract representative (cor). Visit sites to ensure proper execution of clinical trial and worked in collaboration with human research protection office and the cor/gor. Guide company and clinical sites to ensure all appropriate documentation has been submitted to government agencies.